A recent Hale ‘Aina ‘Ohana charcuterie program presented by Bruce Aidells and Chef Franco Dunn illustrated the wide-spread interest in charcuterie. Fifty-two culinary professionals attended the February 21 professional charcuterie class including chefs from the Kahala, TOWN, Four Seasons, 12th Avenue Grill, Halekulani, Michel’s, Roy’s, and Grand Cafe. 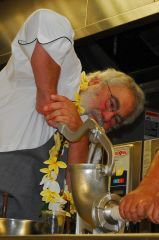 On February 22, over 120 culinary students from Leeward, Kapiolani and West Hawaii attended a student-oriented workshop. Bruce Aidells is America’s “go-to guy” for all issues involving meat and meat cookery. He is called upon for information and insights for most national newspapers, including the New York Times, Washington Post, Los Angeles Times, Chicago Tribune and many more. Aidells, who founded Aidells Sausage Company in 1983, also has a reputation as an innovator in the gourmet sausage industry. Since 1982, Aidells has written 11 cookbooks. Four have received cookbook award nominations. His first book, with Denis Kelly, Hot Links and Country Flavors, received the IACP Julia Child award for best single subject cookbook in 1991. The Complete Meat Cookbook was nominated for a James Beard Award in 1999 and Bruce Aidells’s Complete Pork Book received another Beard nomination in 2005.